Even stranger, though, is that it turns out the schoolchildren in Hitchcock’s The Birds sing an American version of this song (with different lyrics–no wife-beating) right before they get attacked by our feathered friends. Finally, to cap it all off, at the end of side 1 Burl sings a song called “Lavender Cowboy,” which is about a cowboy who wants to be like the other “he-men” but “only has two hairs on his chest”!! In this context, “Willie Wallacky” could seem possibly to have wife-beating overtones, too. I too had a Burl Ives record as a child but not the one you are describing. “Lavendar Cowboy” is featured in the great, great documentary Before Stonewall (about early 20th-century LGBT culture)–I recommend it highly. Yay! Jen’s writing about music again. 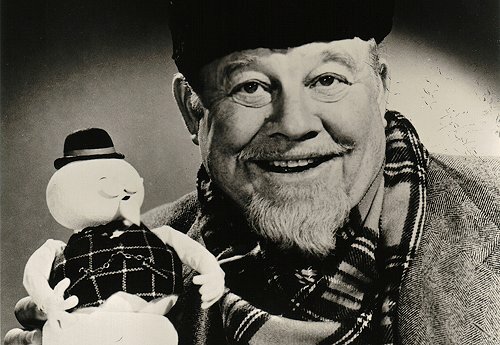 Burl Ives is a big deal in our household–sparked by the “Gray Goose” being used on the soundtrack to Fantastic Mr. Fox, but fuelled by my wife’s childhood love of Mr. Ives. She should be along shortly to offer her comments. This post (and our conversation about it) makes me wish I had all my vinyl back: albums all inherited from my grandfather (god only knows what is in there, but he was obsessed with Fats Domino) and my uncles (this being how I heard Pink Floyd’s “The Wall” at the tender age of something-or-other, and vividly remember being transfixed and realizing I would never be the same). Unless my cousins have ransacked (likely), these boxes should be intact somewhere in Virginia. Time for a road trip! I am looking for the title of a Burl Ives song with the words. “This is the last will and testament of James Earl Bandy, being of sound body, soul and mind. I don’t have much to leave you, just the love of an old man, born in the year of our Lord, nineteen aught nine.” Anyone remember it? The list of character names may have been a list of men whose names he turned over to Joe McCarthy in the 1950’s. Many entertainer-types were called to name names of other high profile people accused of being Communists or dupes. Most declined, such as Pete Seeger, while others gave names, such as Burl Ives. Ives list of names in songs may have been a way to repent. Or my guess at his list of names might not be true.